WMD has been found in Iraq. A military intelligence report released this week confirms that the US Military has uncovered about five hundred chemical munitions in Iraq since the start of the Iraq War. You might expect to see Madonna, Michael Moore, Whoopi Goldberg, Nancy Pelosi, Cindy Sheehan, George Soros, Markos Moulitsas Zuniga, and Janeane Garofalo forming a line a mile long down Pennsylvania Avenue, waiting paitently to apologize to the President of the United States. You would be wrong. No, even the discovery of five hundred chemical munitions isn't enough to make the rabid anti-war critics accept that this war is justified. This war can't be justified. Speaking for myself, I can say that I never doubted for a moment that Saddam had WMD. This wasn't just a leap of faith, a blindess to reality, or an unquestioning patritiotism as the Left would like you to believe. There was indeed plenty of evidence to suggest that Saddam had had WMD. Here's a question for all your liberal friends--if there was no WMD in Iraq, why wouldn't Saddam comply fully with weapons inspectors? Why was this gentle lamb Saddam--who apparently had nothing to hide--hiding so much? First of all, Georges Sada, Saddam's number two man in the Iraqi Air Force, wrote in his book, Saddam's Secrets, that Saddam's WMD had been transported to Syria on the eve of the war. David Kay, head of the Iraq Survey Group, is on the record saying that such a scenario was quite possible. "There is ample evidence of movement to Syria before the war -- satellite photographs, reports on the ground of a constant stream of trucks, cars, rail traffic across the border. We simply don't know what was moved," said Kay. But for those too sceptical to believe an Iraqi general that such weapons existed, there was further proof. There were the so-called "Saddam tapes", discovered after the war, in which Saddam is caught discussing weapons of mass destruction and acts of terrorism against the United States and Great Britain. These particular tapes were found among 35,000 boxes of audio tapes and documents in Saddam's seat of power. Obviously, only a small fraction of these documents and tapes have yet been translated and analyzed. Here is an actual quote from Saddam Hussein--"Terrorism is coming. I told the Americans a long time before Aug. 2 and told the British as well … that in the future there will be terrorism with weapons of mass destruction." Saddam may not have meant that Iraqi proxies were to conduct this type of terrorism, but only that somebody was going to attack the United States. Or he may have meant that terrorist groups, acting at the behest of the Iraqi government, would use WMD against the United States. In other words, exactly the scenario that President Bush warned us about on the eve of the Iraq War. On the tapes, Saddam's son-in-law, Hussein Kamel Hussein, bragged about deceiving weapons inspectors. "We did not reveal all that we have [to the inspectors]," Kamel says in the meeting. "Not the type of weapons, not the volume of the materials we imported, not the volume of the production we told them about, not the volume of use. None of this was correct." Just like the dicovery of actual WMD in Iraq, the Left didn't consider the Saddam tapes to be proof of anything. Danny Schechter, author and producer of the film version of "Embedded: Weapons of Mass Deception," didn't believe that the tapes represented anything new. "Nobody denies that Saddam Hussein did have a WMD program. The United States knows that, we have the receipts, we supplied some of the initial technology," Schechter said. He later went on to assert that the weapons were destroyed after the 1991 Gulf War, which was precisely what Saddam was required to do under the terms of surrender, UN Resolutions 687 and 689. But even the tapes itself contradict Schechter on this point. After all, Hussein Kamel was talking about deceiving weapons inspectors in the mid-1990's. The idea that Saddam destroyed his entire stockpile of WMD and was behaving himself like a good boy is also belied by the fact that in 1995, Iraq was caught red handed developing biological warfare agents. No, despite what the ignoramous Schechter believes, the weapons were not destroyed after the Gulf War. Another critic of the Saddam tapes was Code Pink's Jodie Evans. She didn't believe that audio tapes of Iraqi officials discussing how to deceive the UN into believing that Iraq had no WMD means much of anything. The government, according to Evans, has "said a lot of things for a long time. There's a difference between what they've been saying and what's real, and when they find something real, I'll comment." Well, Ms. Evans, they've found something real. Actually, they've found five hundred somethings! Though the document does not specify what this "chemical material" is, there are red flags all over this document. First of all, Hussein Kamel Hussein is Saddam's son-in-law, and the same person previously mentioned in the Saddam tapes talking about how reports to the United Nations were completely bogus. He was also, according the ABC News, the man in charge of Saddam's WMD program (What WMD program was he in charge of, if there were no WMD?). So, according to the document, the head of the Iraqi WMD program, while "conducting his responsibilites, did bury a large container said that it contains a Chemical Material." Another indicator that this "chemical material" was actually a banned weapon is revealed with the line, "A large number of the region residents know about this container from the large number of machines used to hide it then." Take note of the word "hide". What was being hidden, from whom, and why? What kind of chemical was this? Drain-O? Dish soap? Of course not, the "chemical material" being hidden was a chemical weapon. Despite the accusations of General Georges Sada, the Saddam tapes, and document 2003-00004530, the Left refused to believe that Saddam Hussein had had WMD. (If only they had such a high standard of evidence when making spurious accusations against President Bush). Nothing short of the discovery of actual weapons of mass destruction would convince the Left that Saddam Hussein had indeed possesed weapons of mass destruction. And now we have those weapons. Amazingly, not even these are proof enough that Saddam Hussein was in violation of seventeen UN Resolutions, right up to the day of the Iraq invasion. The Left and its media (that is, the "mainstream media") have tried everything to discredit these finds as insignificant. Here's the lead to an Associated Press story about the discovered weapons: "Hundreds of chemical weapons found in Iraq were produced before the 1991 Gulf War and probably are so old they couldn't be used as designed, intelligence officials said Thursday." WMD has been found in Iraq! But don't worry, it doesn't mean anything. Of course, it means everything. Notice that it says that the weapons could not be used "as designed". What does that mean? Could they still be used in a modified fashion? Could terrorists use them to kill innocent civilians? According to AFP, "The intelligence overview published Wednesday stressed that the pre-Gulf War Iraqi chemical weapons could be sold on the black market. 'Use of these weapons by terrorists or insurgent groups would have implications for coalition forces in Iraq. The possibility of use outside Iraq cannot be ruled out,' it said." Furthermore, the report does not make the munitions sound quite as harmless as certain critics have implied. "While agents degrade over time, chemical warfare agents remain hazardous and potentially lethal," says the report. The age of weapons is particularly interesting. Were they too old to be used "as designed" in 1991, when Saddam supposedly destroyed all of his chemical weapons? How about during the 1990's, when UN inspectors played cat-and-mouse with Iraqi government officials who,--despite "not having" any WMD--repeatedly led weapons insepctors on wild goose chases? Were they too old when, in 1998, Saddam kicked weapons inspectors out of the country? Were they too old when, in 2002, Iraq made its final report to the UN, rehashing old reports that the UN had already deemed insufficent? Were they too old three years ago, when US and coalition troops took down the brutal dictator? I'm not sure I know at what point these weapons passed their experation date. I don't care either. In fact, I was under the impression that it was exactly these types of weapons (that is, pre-1991 weapons) we were looking for the entire time. After the Gulf War, Saddam Hussein was required to destroy all of his WMD, so that he could be better "contained". It was the contention of the United States that Saddam never fully complied with these resolutions, and hung onto these old weapons throughout the 1990's and up to 2003, when the US invaded. And we were right. If these weapons are so old, than that means that they were sitting there in Iraq in 2003, just as President Bush said that they were. Sorry, but the age of these weapons only proves the American case for war more correct, not less. Furthermore, the idea that these weapons don't "count" because they're expired is ridiculous. It harks back to the old canard of the Left that it is the responsibilty of the United States to prove that Iraq possessed WMD (which we have), and not the responsibility of Saddam to prove that he didn't have WMD (which he never did, and never could). Now it is not only the responsibilty of the United States to prove the existence of WMD, but also the relative condition thereof. If not, then the whole war is bunk, George W. Bush is a liar, and America is a colonial power. The excuse that these chemcial weapons found in Iraq were too old was applied to the munitions containing the deadly chemical sarin, a nerve agent sometimes referred to as GB. The other agent discovered among the five hundred chemical munitions was mustard, a blister agent. In an attempt to down-play the report, the media and the Left have tried to portray mustard agent as not particularly harmful, and therefore, not really a weapon of mass destruction. According the an Associated Press story, "And any of Iraq's 1980s-era mustard would produce burns, but it is unlikely to be lethal, Kay said." I may have to draw on some of my own expertise here as a former nuclear, biological and chemical warfare specialist in the US Army (not nearly as cool as it sounds). When reading this, my first thought was Mustard gas is not designed to kill people! In other words, it's no surprise that the mustard agent found in Iraq "only causes burns" and "wasn't deadly". The same could be said of mustard gas found anywhere. That doesn't mean that it is not a weapon of mass destruction, or finding mustard gas that "only causes burns" somehow makes this discovery illigitimate. To the contrary, mustard gas was prohibited to Saddam Hussein under UN resolutions 687 and 689. It is also classified as a chemical weapon under the 1993 Chemical Weapons Convention. The excuse that the mustard agent found in Iraq is not lethal (when in fact, it isn't designed to kill) means nothing. This is a significant find. The goal posts are slowly moving. First, the whole war was a lie because we hadn't found any WMD in Iraq (despite audio tapes and documents in which Saddam and company discuss their WMD). Now that we have found WMD, it suddenly doesn't count. The sarin is too old, and mustard gas isn't even deadly! The discovery of five hundred chemcial weapons munitions means nothing! Bush still lied, the war is still for nothing! I do not believe for a second, of course, that these five hundred munitions were all Saddam possessed. These were just the crumbs he left behind in a hurried and imperfect coverup operation. The rest of the weapons are problably exactly where General Sada said they are--in Syria, probably moved there by Russian Spetsnatz units. In any case, no matter where the rest of the weapons are, no one can credibly claim from this point forward that "Bush lied" or "there was no WMD" (although I don't think that will stop anyone on the Left from making those assertions; I've never known a liberal to let the facts get in his way.). These statements are simply not true. 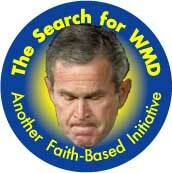 There was WMD in Iraq. The weapons survived the 1991 Cease-fire agreement (when Danny Schechter, author of "Embedded: Weapons of Mass Deception" claims that they were destroyed). The weapons were there in 1998, when weapons inspectors were evicted. And they were there when American troops crossed the border into Iraq in March 2003. This is the story of the year, and it's being ignored. The excuse that these weapons really weren't all that deadly--despite what the report itself says--has been used to relegate it to the back page of the newspaper. It belongs on the front page. It belongs on the front page for at least as long as that silly Abu Ghraib story stayed there. Time and Newsweek should be running cover stories like "Bush was Right" and "U.S. Vindicated". But I won't hold my breath waiting.